‘Counting Sheep’ at Vault Festival. “We should be rioting in the streets” is the thought that flashed into my brain, as I stood at Counting Sheep, an immersive performance that puts you at the heart of the 2014 anti-government protests in Ukraine, and surrounds you with performer/protestors waving blue flags with gold stars. The protests we’re recreating were sparked by the president’s last-minute move to sign a treaty with Russia, instead of taking a step towards membership of the EU – prompting people to pour into Kiev’s Maidan Square in a furious surge, setting up soundsystems blasting out Ukrainian techno, blankets, food supplies, flaming barricades of wood, sandbags and tires. As an audience member, you have no choice but to stand up and join the protest. Afterwards, I read through another succession of headlines documenting the UK government’s shambolic path towards a hard Brexit that not even they want, on a train regularly crossed by homeless people trying to avoid sleeping out in the settling frost. I went on a few anti-Brexit, pro-EU protests, before and after the vote. They gave me a strange sense of dutifulness, undercut by futility, like going to church when you’re not a believer. There’s a set route, carefully agreed with the police, who observe the whole thing with a kind of disconcerting benevolence (not a level of benevolence you’d get at other protests: this is a crowd deemed, by its levels of whiteness, middle-classness, to be ‘safe’). The placard slogans were often more about irony than anger: ‘Can’t live, if living is without EU’. We know we can. We also know that we’ll leave tidily by 8pm, whether or not our demands have been heard. Given that British people have such a poor track record when it comes to protesting (memorable, myth-worthy exceptions like Greenham Common and Cable Street excepted) Counting Sheep feels necessary. It’s not really a way of learning about the events of the 2014 Kiev Uprising (although the facts do trickle through, you’d be better off following news coverage for that). It’s more about learning about what it feels to pour out into the streets in anger and not go home. It’s intensely sensory. Ukrainian techno pounds in your ears, especially at first, when the protests starts as one big party: there’s dancing, beetroot-on-rye to eat, placards to wave. The use of video projection (designed by Josh Pharo) is ingenious– you’re in between two giant screens made from tacked together hessian, which project real footage of the protests at full life size. The partying turns to bedding in, turns to danger. You pass sandbags, see rising columns of thick black smoke. It’s uncanny and uncomfortable and essential: this stuff is real, and you’re not allowed to forget it. As endless newspaper editorials testify, we’re apparently in a cultural moment that’s obsessed with ‘authenticity’ and ‘experiences’ over material possessions, and Counting Sheep offers both. As did The Jungle, the Young Vic-turned-West End immersive show which recreated the Calais Jungle. Both shows are, on one level, completely necessary: they make recent events bold and vivid in the minds of people who might have only encountered them in passing headlines. They bear witness to human experiences which are effaced by bald facts, and told partially and incompletely, by news outlets with priorities and agendas of their own. But these shows also involve a level of inevitable cognitive dissonance. However carefully created their worlds are, you’re still at ‘an entertainment’ and both productions remember that, providing moderate and manageable levels of discomfort and guilt – their joy, humour, and exhilarating moments of participation linger in your memory, just as vivid as the horror. A spoonful of sugar makes the medicine go down. The Jungle mixes impressive explorations with the shades of moral grey surrounding migration with a surprisingly light tone: there’s wit, rousing choruses of Jerusalem, and the implausible sweetness of a young girl refugee. Counting Sheep has joyful feasting, dancing, and the final heartwarming comfort of a marriage. Both carefully steer clear of intense bleakness, of confronting or flooring their audiences with too much painful complicity. Does investing in simulated activism make us more likely to protest? Does it set fire to the damp newspaper-headline-stuffed hollows inside us, stir us to turn knowledge into action? Or is it more of a balm, a channel, an outlet for feelings of powerlessness? I don’t know, at all. In both performances there’s nothing to lose (not even your dignity) which gives them a level of safety. When words flash up on the screen, telling us that over 700 lives were lost in this uprising, it’s a jolt. A reminder that what we’re recreating is a real, recent, tragedy on a huge scale – even if it’s one that’s a step on Ukraine’s wider trajectory towards a more democratic, more pro-EU government, and ongoing war to defend the border with Russia. Counting Sheep is treading a delicate balance between witnessing this pain, and contextualising it as part of a wider political situation, and in using it– on some level– as the backdrop to a love story between real-life couple Mark and Marichka Marczyks. Marichka is a musician who’s grown up coming to this square, and sees her beloved music academy surrounded by protesters and flames. Mark is a Canadian visitor who gets swept up in the protests, and in a love affair with her, in one tumultuous sleepless sweep. His perspective feels more dominant (perhaps because he, like us, is an outsider). And to me, the balance of this show feels weighted a little too much towards it, and towards his and Marichka’s heightened desperate love affair, rather than fully integrating us into the wider struggle and higher stakes at play. But there are so many moments that are still lingering with me: the way that the veil of a bride, married at the height of the protests, becomes a shroud. The sense of fluidity and energy in the space, the way that the cast interact with Nicolai Hart-Hansen’s design to turn a feasting table into a barricade. The yearning resonance of the folksongs. Counting Sheep started life at the Edinburgh Fringe in 2016. I didn’t see that production, but since then its original creators Mark and Marichka have brought Belarus Free Theatre onboard, and from reading the reviews, it seems like maybe the tone has shifted from bacchanalic abstraction (animal masks and live musicians were originally involved) into something more closely naturalistic, something that foregrounds clarity and storytelling. I think it’s the clarity I’m most resistant too: the show’s most powerful moments are the most chaotic ones, the parts where you’re disorientated in a fast-shifting environment whose rules you don’t fully understand. The Jungle and Counting Sheep are wrestling with huge, fundamental central conflict: between authenticity and the artificiality required to create it, between bearing witness and creating a marketable show that has to sit alongside less tangled theatrical propositions. And I’d so much rather that theatre tries to inhabit that contested, difficult space than have a performance landscape that sits, politely, comfortably on the sidelines. 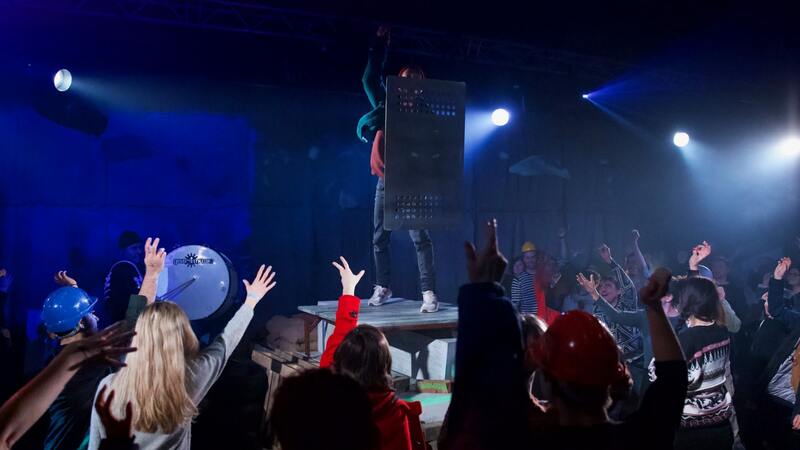 Counting Sheep is on at Vault Festival until 17th March. More info and tickets here. For more on immersive theatre, read Frey Kwa Hawking’s review of The Jungle.